Tickets on sale now, in store and online! 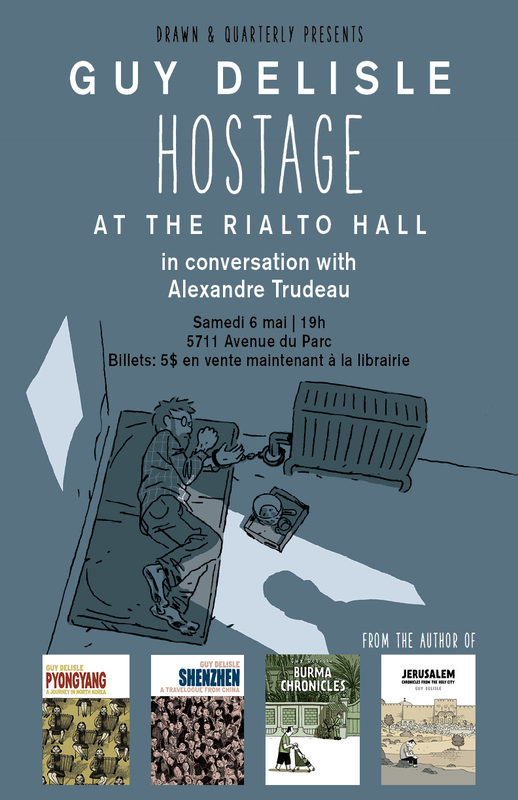 Join us on Saturday, May 6th at the Rialto Hall for the launch of the highly anticipated, non-fiction page-turner Hostage by award-winning cartoonist Guy Delisle (Pyongyang, Jerusalem, Shenzhen, Burma Chronicles)! Set in the Caucasus region in 1997, Hostage tells the true story of Doctors Without Borders administrator Christophe André who was held captive for over three months. Recounting his day-to-day survival while conveying the psychological effects of solitary confinement, Delisle’s storytelling doesn’t just show André’s experiences, but brings you into the room alongside him. Hostage is a thoughtful, intense, and undeniably moving graphic novel that takes a profound look at what drives our will to survive in the darkest of moments. Ticket price: 5$ - Free with book purchase (Hostage, S'enfuir). Tickets on sale now, in store and online!